Can Margill Loan Manager do progressive Advances to my clients? You first create a new Record. In this case the first advance of 15k is on 06/06/2017 with regular payments on the first of each month starting July 1. To be repaid over 5 years (60 months). You can Compute and the following preliminary schedule is created. If we were to leave it at that, we would have 60 payments of $305.59. Now for the next draws. Do you know when they are to be paid of not? If so, you can enter them on the set Advance dates as Additional Principal (Loan). Notice below there are 2 more Advances, the first for 10k and the second for 25k. We include these as negative amounts to increase the Balance. I also used the right mouse click to recompute the payments to get 0.00 as my ending balance after 60 months. So the new payments become 1099.54. 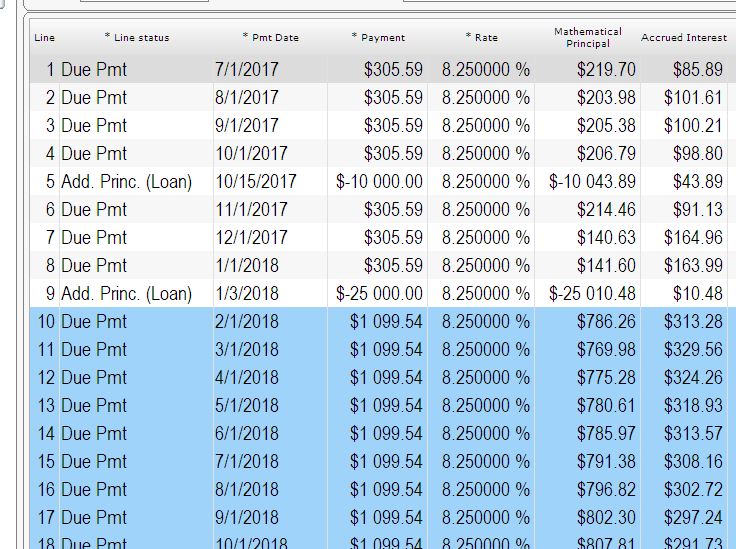 You could recompute the payments to give 0.00 at any time or stretch out the loan (add more payment months). As you wish…. 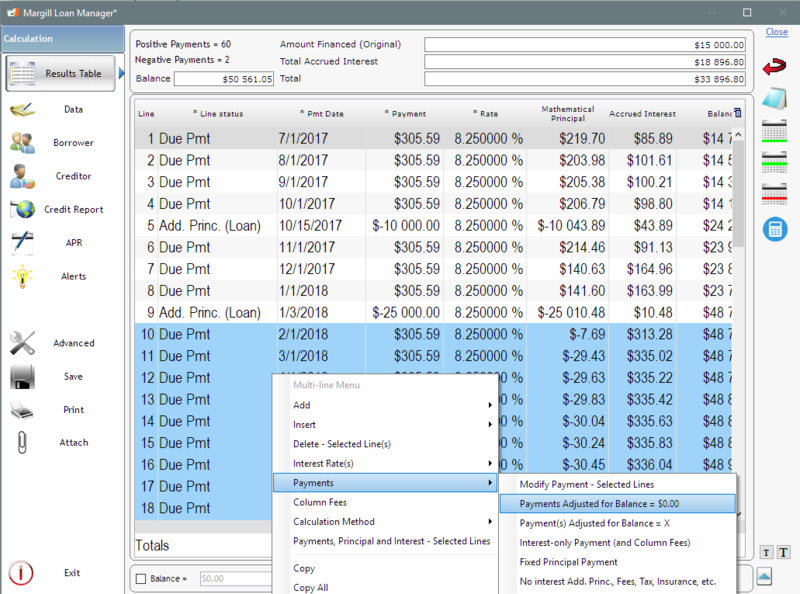 If you do not know when the money is to be advanced to your borrower, then you enter the Additional Principal as the information comes in and your recompute your payments (increase them) as more principal is advanced. https://www.margill.com/wp-content/uploads/2017/02/jur-logo-margill-avec-spacer-top_EN-300x73.png 0 0 Marc Gelinas https://www.margill.com/wp-content/uploads/2017/02/jur-logo-margill-avec-spacer-top_EN-300x73.png Marc Gelinas2017-05-16 20:04:122018-10-05 19:10:28Can Margill Loan Manager do progressive Advances to my clients? We would like to welcome Strada Education Network as a new user of our Loan Servicing Software, Margill Loan Manager. Strada is a non-profit organization that works to help students through their education path. They offer many different types of solutions to improve student outcomes in higher education and facilitate successful career transitions. More information on Strada Education Network website. To see the full list of new features, please visit our Release Notes. We are already working on Version 4.4, which should be released in late October 2017. I need to break down the due payment for the next fiscal into Due payment interest portion total and Due payment principal portion. 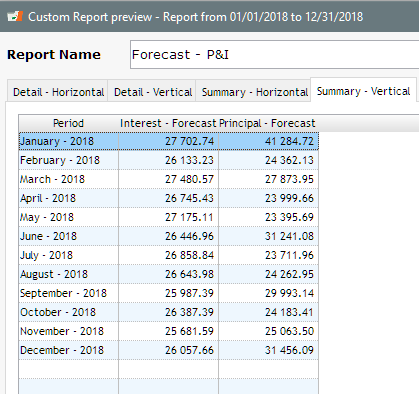 If you are on version 4.3 and above (go to https://www.margill.com/get to download) go to Reports > Personalized Reports > Record List (Customized) with Period Breaks. Click on New, name your report and select the fields from the left. 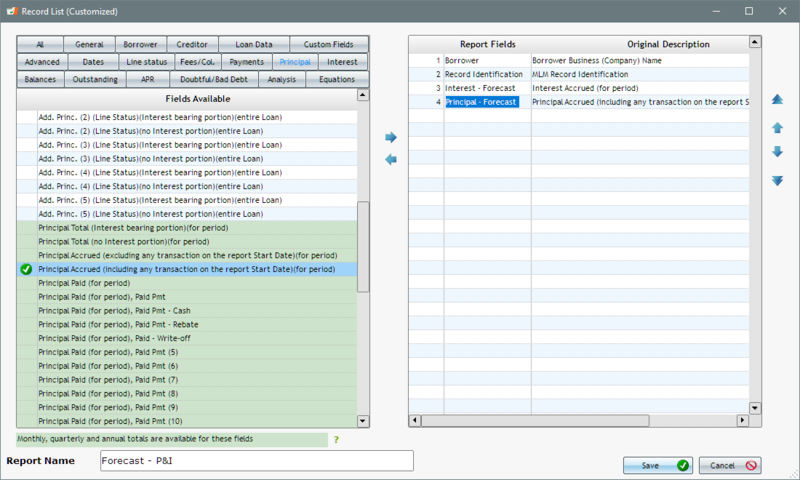 In the example below I selected the Borrower Business and Loan ID to identify each loan. Then I selected, under the “Interest” theme, the “Interest Accrued (for period)”. We call it “Accrued” but in fact, for projections it is TO BE accrued. I will rename my column header to “Interest – Forecast” (see below). 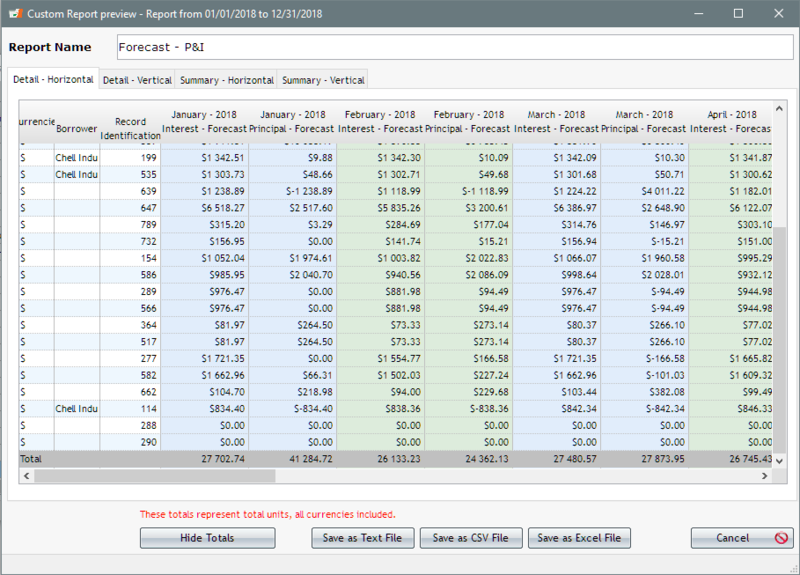 Finally, select, under the “Principal’ theme “Principal Accrued (including any transaction on the report Start Date)(for period)” – renamed to “Principal – Forecast”. Report template is now complete. 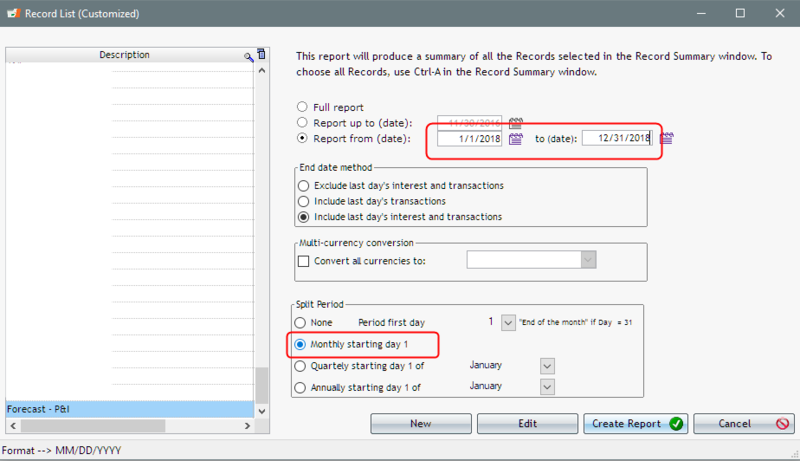 First select the desired Records from the Main window and go to Reports > Personalized Reports > Record List (Customized) with Period Breaks. This report will break down the principal and interest by month, quarter or year. So you can do short and long term projections – short term for 12 months broken down by month and short/medium/ long term over 5 years. Now run the report which may take few minutes (thousands of calculations are done!). You then get results that can be shown in a variety of ways (horizontal, vertical and summaries). You can even show Totals.